The use of composite carbon fibers has been, more or less, mentioned in context of extra high performance speedy cars or vessels. Reading about such technology I have always had a feeling that it is something in the sphere of science fiction and absolutely beyond the limits of the average wallet. However, as the time passed and the technology became more efficient, composite carbon fibers in terms of nautical equipment became more affordable. One of such examples could be the range of products by GS Composite Company. First time I got in touch with their products was when I stepped on their carbon composite gangway. I felt extremely safe when walking because it is coated with anti-slip thread on the walking surface; and its square shape prevents any wrapping on the torsion. Furthermore, when I had to remove it before taking off I realized that it is absolutely easy to handle and light. It is equipped with integrated, acid free wheels adjusted for lifting rope as well as with acid free aluminum male deck fitting and hinges. Its head is designed not to get in contact with the deck surface or other part of the boat even when moving. My excitement reached the top when I realized that its appearance could be totally customized in terms of colors and brand design (the name of the company or boat…). The use of GS Composite gangway will make your life a lot easier while stylish appearance would increase your image in the eyes of other sailors in the marina. Last but not least, GS Composite gangway floats in the water! 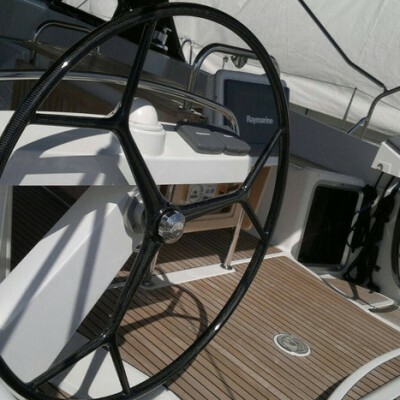 Besides fancy gangways, GS Composite Company produces performance steering wheels as well. These steering wheels are in a so called monocoque technology, further improved by GS Composite’s no bonding technology. Besides a modern minimalistic design, these steering wheels provide the same stiffness as traditional wheels but with significantly decreased weight. As they have lower rotational inertia, the feedback from the steering system is improved which results in lower power consumption of auto-pilots. Thanks to GS Composite commitment to the customers, even the steering wheel could be customized by positioning logo on inox hub via laser engraving.